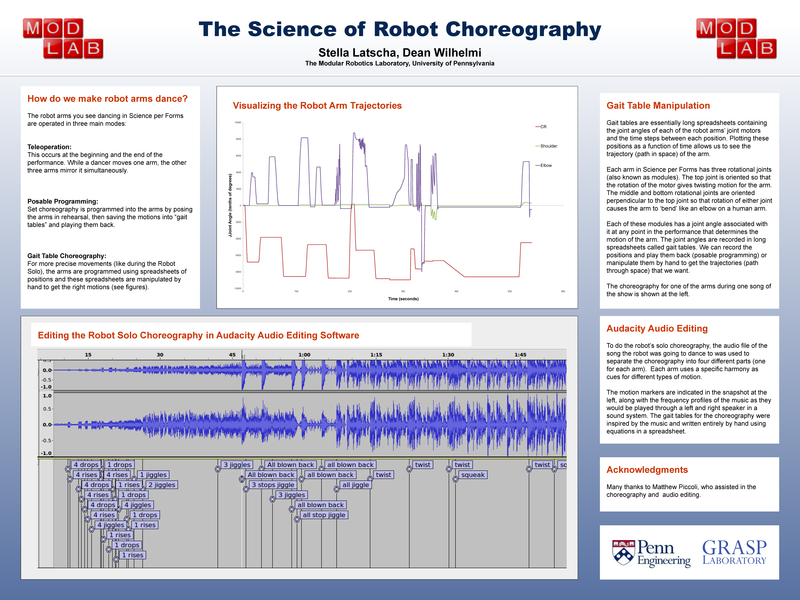 The Modular Robotics Laboratory (Dean Wilhelmi, Stella Latscha, Matthew Piccoli) collaborated with other technology studios from Penn (IKStudio under Simon Kim) and Harvard, as well as dance studio Carbon Dance Theatre (co-choreographers: Meredith Rainey & Marcel W. Foster) to create a dance performance blending art and technology called Science Per Forms. Inspiration from the show stemmed from The Cyborg Manifesto by Haraway; Science Per Forms sought to highlight the growing influence of technology and play with its various artistic aspects. The final product turned out to be a beautifully choreographed and thought provoking performance. Cybernetics and Dance – performance from Ibanez Kim Studio on Vimeo. The robotic arms were a chain of 12 CKBot modules with lightweight foamcore arm sections and end effectors. Each arm had 3 CKBot modules: a continuous rotation module at the top “shoulder” joint and “shoulder” and “elbow” U-bar CKBot modules. The programming for the modules was done in python. The performance involved three types of arm movement: teleoperable, where the dancers could move one arm and the other three would mirror the motion in real time, posable, where gaits were pre-recorded by the choreographers moving each arm and saving the motions, and gait table choreography, where ModLab choreographed the robot solo using excel gait tables and audacity audio editing software. Aug 27, 2013 | Filed under CKbot, Uncategorized and tagged with Latscha.